I am continuing to write material for the first module called, Better The Demon, and hope to finish this year! Last year, I had hoped that I would finish it, but this time, I feel more confident. This is because I have decided to not be so worried about some details that may easily be overlooked by some players anyway. On occasion, I play an RPG game to relax, and I have noticed that many do not have the same detail, and I do not feel it detracts that much. Now, I am going to concentrate on the remaining conversations, creatures and encounters. I will still continue to write quests, but I believe I have them all accounted for now, and all that remains is to join the dots. Now, to the main point of this post: How important is atmosphere and lighting to most of you? Now, on the surface of it, the obvious answer would be "utmost", but I am asking it from the point of view of "realism". i.e. Should an eerie underground complex have "ambient" lighting to help complement the existing lighting to enhance "atmosphere" or should just the existing lighting do all the work? Now, in my designs, I have opted for a combination of priorities, subject to my own preferences for the area in question. However, I would be interested how you might consider this aspect of game play. i.e. If I need light, then I should find it .... or .... I wish the design made it so I could see. Which best describes you? An eerie altar looms out of the darkness ahead! In the above example, I have removed all ambient lighting because I wanted the altar to stand within existing lighting only, but it may be better realised with additional lighting? Is the scene too dark? Yet, if the PC is using their own light source (via torch or spell), then this will contribute towards the overall lighting of the scene anyway. The point is, what do you think works best for your general gaming experience? Should I add additional lighting to areas to enable a "clearer view" or leave them to existing light only to be more true to the scene? I have started a second poll, called "Atmosphere & Lighting" for you to vote, and leave comments as required. If you played my campaign, you know I favor the "real lighting only" in dungeons. In stores, towns and areas where there's not going to be monsters or whatnot, I will use the ambient lighting or make sure there are sufficient light sources, no need for a player to have to fumble around. Of course, there's magic, so glowing mushrooms, glowstones, and such often provide light in the "real lighting only" dungeons. This is often done to mark turns and junctions in the map. Islander featured legit darkness. There was glowing shrooms where I wanted, and other ways for light to come in IF I wanted it, and if I did it was because I wanted it to be a certain color and behavior to add atmosphere. For example, if I wanted the dungeon to be purple in hue, well I had to add a bit of natural light sources. If I leave it up to the player only it will always be the color of their light spell which can lack character. So what I would have is pitch black with certain areas that were lit, but you wouldnt be able to get to them if u dont learn how to use cantrips. And on that note, I liked having an actual use for level 0 spells, so I say once you go black, u never go back. I should add that I did warn people on the Vault page that things would be dark. Indeed I had quite a few areas that were either pitch black entirely, or only one light at a cave entrance representing light coming from outside. Darkness gives value to infra-vision and light emitting items. Those have zero value in stock NWN2, since the official campaigns are never dark enough to give light items any value. One thing I see in games is "emphasized lighting", where if things are dim, what lights exist in the area are brighter than they might naturally be. I believe this is done for artistic reasons. a) A reason for the light spell, torches and infravision. b) Real darkness unless in "casual" environments. c) A use of glowing objects to add ambient lighting. Interestingly, though, the current trend appears to support "general visibility" rather than "real light" environments. Looks like I will have to do the same as you Kamal, and warn that some areas do require proper lighting to play. "Once you go black, you never go back" ... Made me laugh! 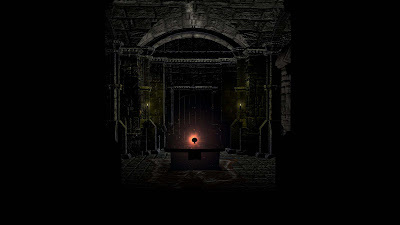 Btw, the eerie altar room in the image looks really good! How realistic is it that you can just hold a key to light up all your enemies and your party has no problem at all dodging and hitting nocturnal creatures in their own cave? remove attack and ac penalty if so. This should be right up your alley, knowing that you have food/survival systems in place as you do, why not take it to that one next level. It's an easy script. -racial visions, light spells, torches, light emitting items. -Also its just dark underground. -Bold brown tint in a earth genasi liar. I voted other since I use the ambient light, but more for mood than for lighting. Placed light sources or player light sources are needed for most unmaintained interior area. I hear you ... and I agree. I hope the voters start to reflect that sentiment too, although I reckon the "others" like your vote counts for this as well. I also do like the ambient suggestions you mention. I have used "fungi" and "subterranean" plants to help like this in some areas. Hopefully, I will get the balance right between different areas so that players will appreciate the need for light sources where it is needed, but not feel too oppressed or forced. They should feel forced. If they aren't forced to use their light then you failed in your task. As far as opressed goes, that term applies more to slaves in egypt than it does to gamer kiddies who have the option to shut off their "Game" at any time. The free game that someone else made. Generally, I like things dark. Light spells, light-emitting items, torches* and dark vision should have a purpose. Having said that, these elements also flatten the ambient experience. So I do favor the minor light-sources that others have mentioned, whether it's light beams from holes in the ceiling, red glow from lava, or others. Unfortunately, even if you do use all these elements, it's still quite easy to have underground (especially cavern) areas come out absolutely dull. Underground areas are not where NWN2 shines (pun intended!). I've played through so many NWN2 look-alike cavern areas that I really couldn't stand another one--and this is *not* due to lack of skill by builders, given the unique and original exteriors I've seen. For this reason, I highly recommend using the various RWS deep tilesets. * Of course, there are often bugs with torches that result in them not emitting light until you transition with them in hand. I've heard that dropping and picking them back up can fix this, but I don't know how well that works. I do take on board the point about well placed ambient lighting. I will add your own suggestions to my mental bank for potential future use. Good pun! I have used some of the RWS tilesets, but I could not (really) avoid using some of the standard underground area. Hopefully, both story, and different style of play may help distract the player from the norm. Re, Torches: So far, I have found all my items that give light have worked OK. They are reworks of Amraphaels own items with timed usage. Hopefully, they will stay working, but I will await what beta testers say when I get that far.